Muriel refuses to talk after Eustace keeps ignoring her, so Shirley makes a giant starfish attack and it can only be stopped at the sound of Muriel's voice. 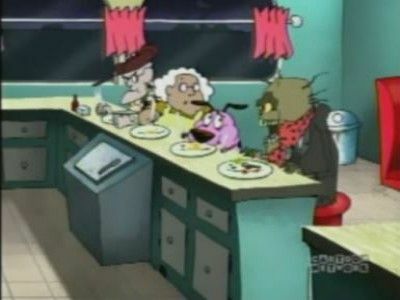 Courage remembers the time when his parents were sent to outer space by an evil vet. Eustace grows a magical tree that can grant him whatever he wants. When it gets more attention than Eustace, he decides to cut it down. Courage protects it, but eventually it's cut down. 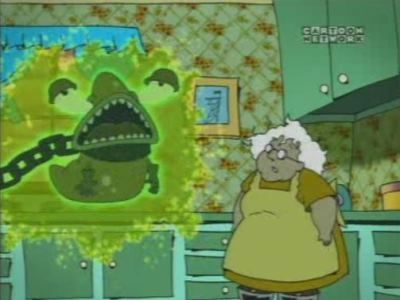 However, the tree has enough power to give Courage the cure to Muriel's new bloated head sickness. A star making squid has just had babies(in eggs)She looses her husband to a giant inhaling whale. The squid ends up landing on Earth where she lays there with her eggs. Courage isn't sure about her at first, until he notices that she makes stars. This also flatters Muriel, but Eustace calls the military so he can get money! The military uses the squid and the eggs for research. 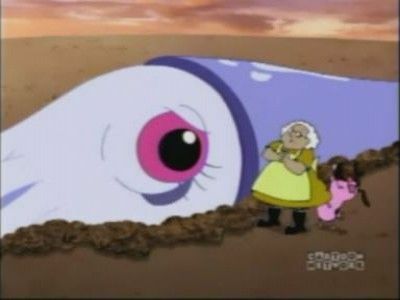 Muriel sends Courage to help the squid. With the help, the eggs finally hatch and the baby squids float up into the heavens. The mother squid turns into a garden. And once again, Eustace gets his just desserts at the end. 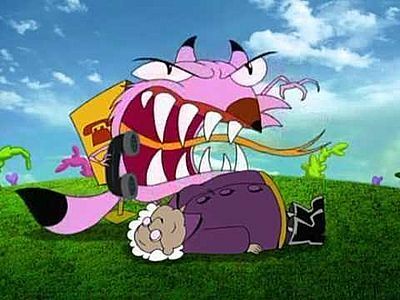 Courage gets turned into a fly by Di Lung outside his house .Eustace trys to smack him, because he hates flys. He trys three times to get the fly but keeps hiting Muriel instead.Courage then must stop a salalite from hitting the house. 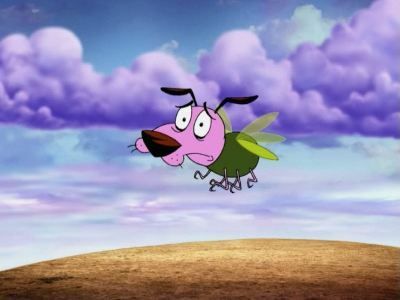 It crashes in there yard.Muriel and Eustace then find out Courage turned into a fly. Eustace walks into the house and wants to get rid of the dog-fly.Muriel says how can you think of getting Courage at a time like this, the satalite almost hit the house. 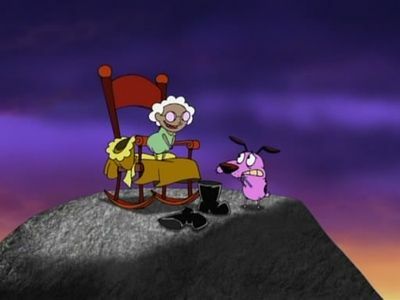 Eustace replies ""It didn't even come close"".Suddenly the satalite raises out of the ground and picks Eustace up with it as it shoots up toward space.Muriel and Courage then just sit in their rocking chair. A whale a long time ago gave his accordian to Icket Bagge(Eustace's father)while playing a unfair game.Now he wants it back.He arrives at the Bagge house and thinks Eustace is Icket. He swims through sand barrages and through the house and eats Muriel and Eustace. Courage's Computer,who is sick and tired of answering Courage's questions about shadows,monsters,etc. 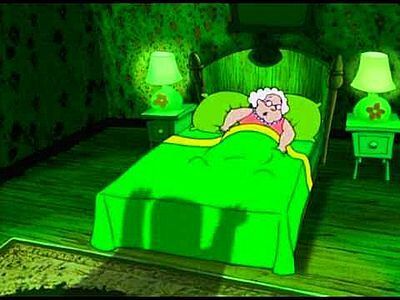 and thinks there not scary so he does something evil ... he uploads his memory into Muriel's body and control's it. He does stunts to make Courage have to rescue the Computer (which is in Muriel's body) Eventually he gets stuck and Courage has to save him from a machine. 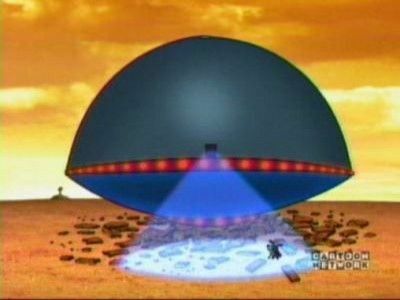 Even the Nowhere News was there to telecast these stunts of Muriel or (the Computer). Eventually the computer apologizes and goes back into the monitor and Muriel returns to her normal self. 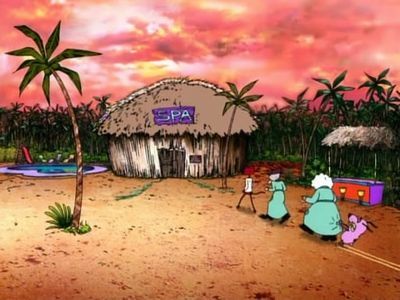 The Bagge's yard gets flouded, Eustace and Muriel go for a swim. Everything is alright until the water rises too high and enters their house. Courage paddles around in the water to the town of Nowhere and stops when he sees a beaver putting up a dam. 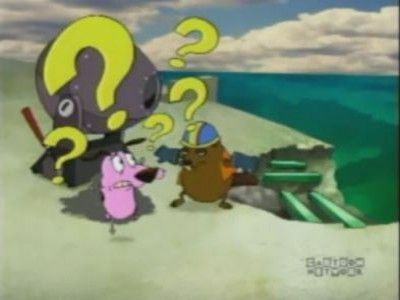 Courage trys to ask him nicely to stop building it because it ruining there home, but the beaver just hits him with his tail. Courage then finds out the beaver's real love is for music and not construction. The beaver starts to hit his tail as a rythem on the dam.Courage picks the string on his yo-yo, like an instrument. The beaver's tale constatly hiting the dam eventually breaks it. 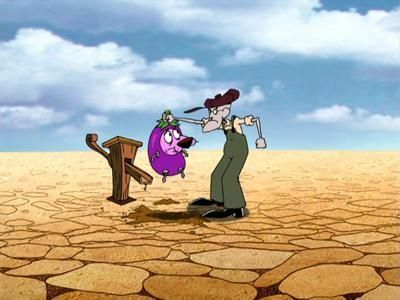 Courage's house's water level drys up to nothing. Muriel and Eustace then attend a concert in a local karaoke-type place to watch Courage and the beaver play their instruments. A lady fish or fishonnary comes to take Muriel, Courage and Eustace back to ""where they came from"". It turns out they really go to an underwater bio-dome becausea all life originally came from the sea. These three fish judges annouce them guilty of uncivilized behavior (sipping tea, wearing shoes, etc.). So they put them in a goldfish bowl with gills that let them breathe underwater. They have to act like fish and even eat fishfood! Courage must save everyone. Muriel's homegrown eggplants (that live underground) aren't getting enough water and try to attack her. 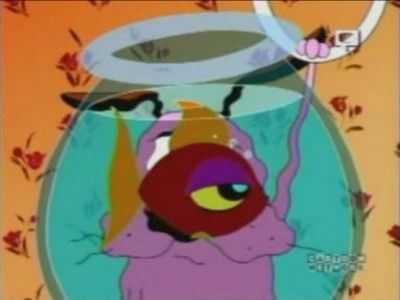 Courage, after constantly trying, finally stops the eggplants from eating Muriel and give the eggplants water. Everything goes back to normal, and Muriel wins an award for the best eggplants. 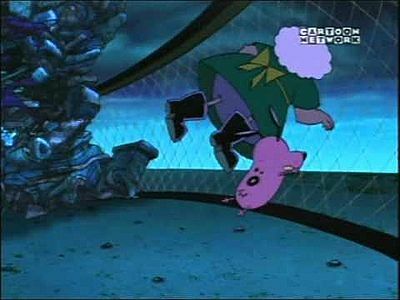 Little Muriel: Muriel is picked up by a tornado and is turned into a little kid. 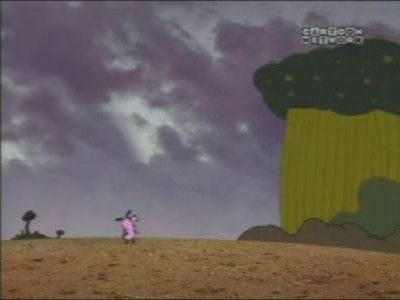 Courage has to put up with Little Muriel's antics and must find a tornado spinning the opposite direction to change Muriel back. Muriel gets a terrible cold, and after a while, she sees a talking slug that wants help. Following directions, Courage and Muriel go to a swamp where there are slugs that are ruled by a snake named Big Bayou. He sheds his skin and makes the slugs make statues out of them. They say Bayou has a magic book that will free them and cure Muriel. Courage gets the book and cures Muriel. Bayou then comes after him, and he bites the book, and his venom magically makes the snake-skin statues attack him. Muriel uses her nail-file to free the slugs. 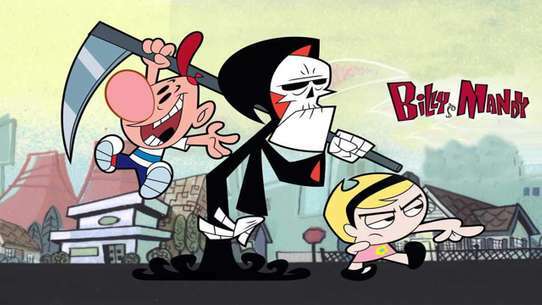 Benton Tarentella returns to make a show about ""angry nasty"" people with Muriel, Eustace and Courage. Eustace is the star because he's very mean. Benton literally takes Eustace's meaness and gives it a form! It's known as Mr. Nasty. Eustace and Mr. 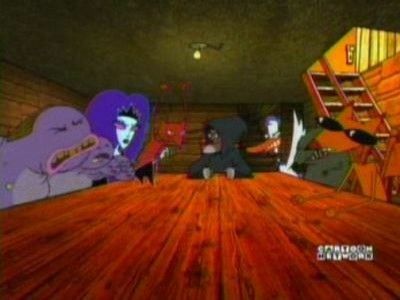 Nasty make lots of money and Muriel and Courage are mad because they always get made fun of on the show. 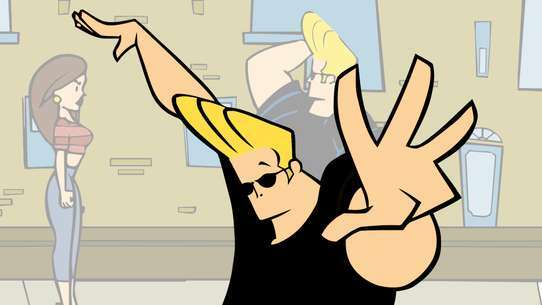 So Courage makes Mr. Nasty angry and throws Benton into quicksand. 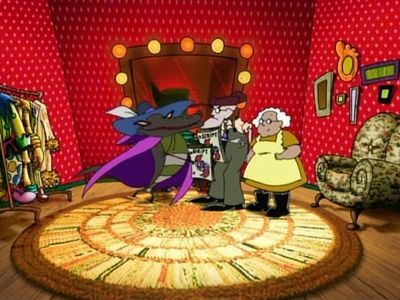 Now Eustace is on a talkshow and loses his money to Mr. Nasty. Ashamed at what happened to her husband, the wife of the Chicken from Outer Space sends their three-headed son to destroy Courage. When they land, they try to just zap him, but they hit Eustace instead. 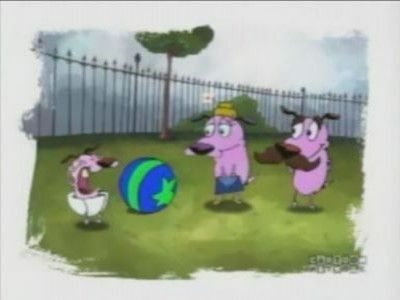 Then they tried a bomb disguised as an egg, but Courage puts it in the toilet, and blows up Eustace. And they finally try tieing Courage up and running over him with a train. The three-headed chicken fails and starts getting in a fight with itself. They start crying because it's mother said that if they don't kill Courage, they can't come home. The middle head always carries a camera, so Courage has them take pictures of Courage being tortured. 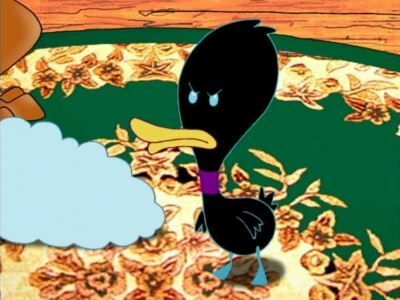 With that, the chicken bades farewell, but Eustace, Muriel, and Courage end up looking like a three-headed chicken. Courage dreams about being a sherif in a Western city. Accompanied by Muriel, they go after the ghost of bank-robbing Eustace, or better known as The Whip. The Great Fusilli: A traveling trailer comes by. The Great Fusilli houses it and decides to make Eustace, Muriel, and Courage acting stars in his portable set. But Courage discovers a bunch of marionettes and sees that Eustace and Muriel have transformed into marionettes. Courage must stop the madness. 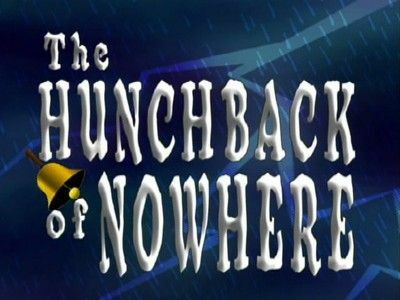 A hunchback who is rejected by everyone wants to find a house to sleep in. 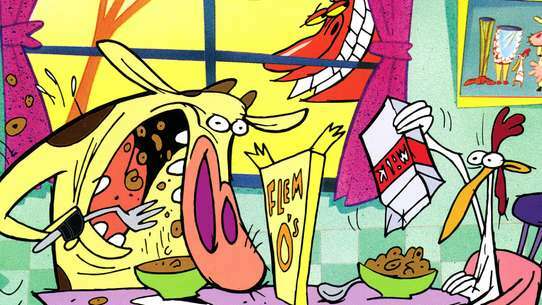 He goes to the Bagge house, but Eustace rejects him. It's raining and Courage gets Eustace's raincoat and finds the hunchback in the barn. He is very friendly and together have fun doing shadow puppets, acrobatic stunts and bell ringing. Muriel is happy to have the hunchback stay with them, but Eustace wants him to go. 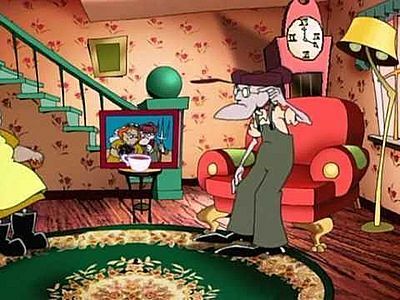 Eustace finally gets tired of Muriel treating Courage so well, so he does something to finally destroy Courage once and for all. He gathers together the villains Courage fought to destroy Courage! 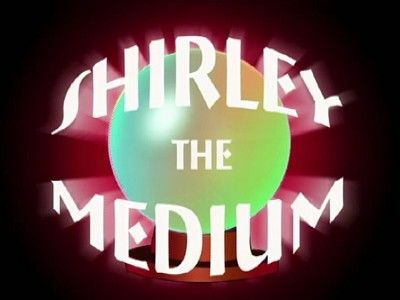 Eustace hires Shirley the medium to settle differences between Eustace and his dead brother, Horace. 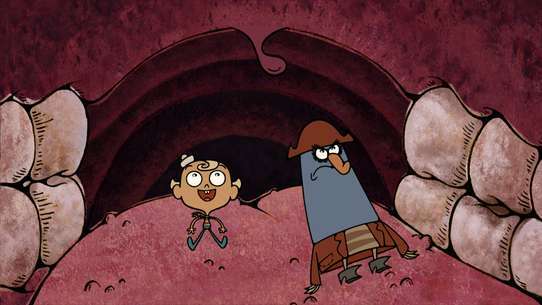 Some creepy stuff happens and Eustace gets his brother's box, but not in a good way. 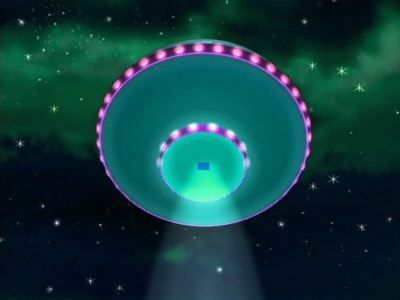 Courage notices a familar UFO come toward the Bagge's House. He sees a chicken (the same chicken from the pilot episode. 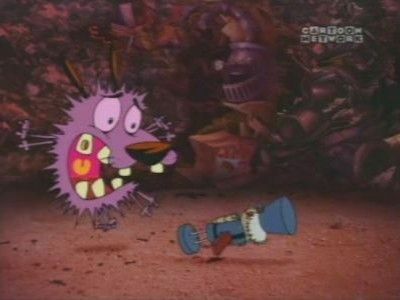 Courage shot the chicken with a raygun and blew up the chicken's head) The chicken wantsa revenge, so he captures Muriel. Courage saves her before any harm is done. He captures Eustace and pulls off his head with a plunger! The chicken (with Eustace's head) chases Muriel and Courage, but later everything turns out OK with the exception of Eustace's missing head.